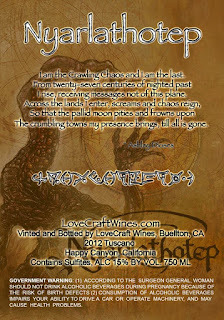 Clark Ashton Smith: The Emperor of Dreams from Darin Coelho on Vimeo. He is doing this documentary by himself and has, so far, gone over the west coast to interview writers/poets/editors who have been influenced by Clark. Darin is putting his heart into making this documentary and any support he can get would be amazing. Lets talk about the perks of contributing! Two words. Clark. Art. Prints of his sculptures! Prints of him with sculptures! Prints of him! Bookmarks! The DVD when it comes out! 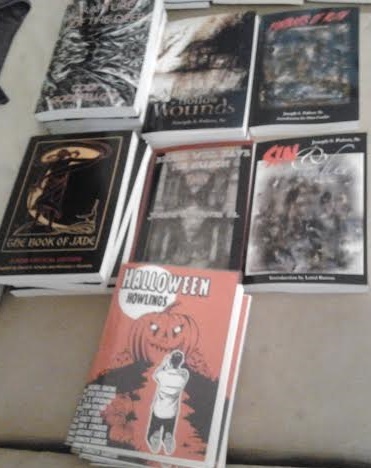 Books! Yesterday, Kyle and I were busy getting ready for the awesome pre-party and film fest this weekend. We went through our book inventory and this is what we are selling at the film fest. 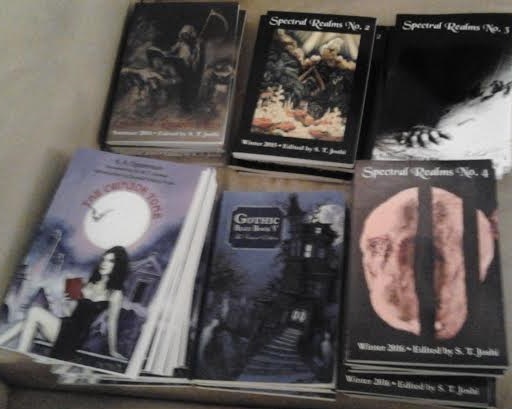 We are supposed to be getting 2 more of the Crimson Tome but at the moment, we have 60 books to sell! All books are Hippocampus Press books with the exception of Gothic Blue Book Vol. 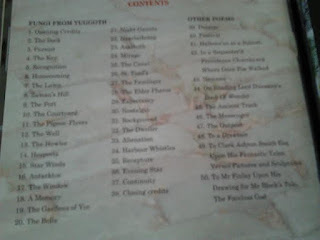 5: The Cured Edition by Burial Day Books and Halloween Howlings by Rainfall Records and Books, signed by Steve Lines. 2 A House of Hollow Wounds by Joe S. Pulver, Sr.
1 Blood Will Have Its Season by Joe S. Pulver, Sr.
1 Sin and Ashes by Joe S. Pulver, Sr.
1 Porttraits of Ruin by Joe S. Pulver, Sr.
Kyle and I will also be reading poetry at the LoveCraft Wines Speak Easy Pre-Party and will be signing wine bottles. 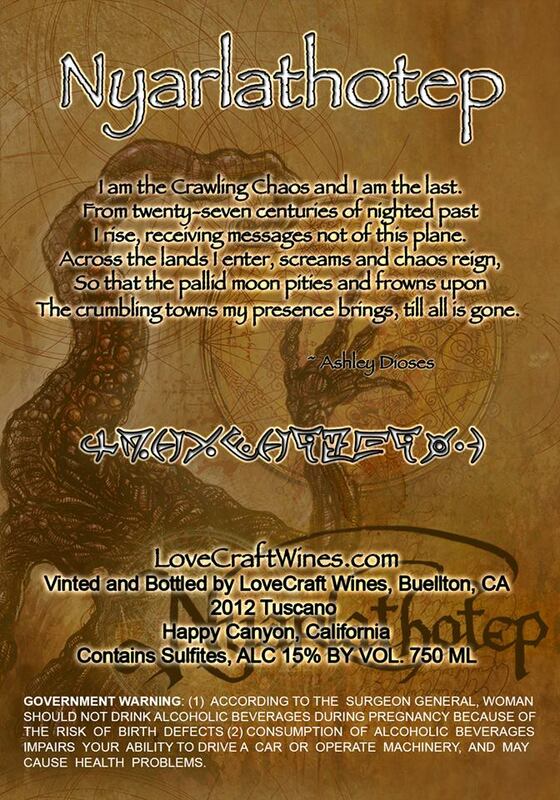 My poem on Nyarlathotep decks the wine label on the wine of the same name. 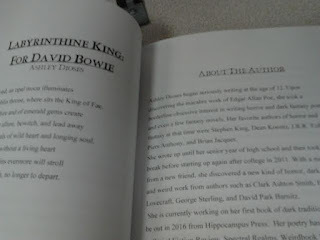 I just received my copy of 47 – 16 : Short Fiction & Poetry Inspired by David Bowie by Penny Dreadful Publications which contains my poem Labyrinthine King. 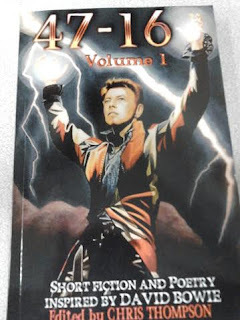 "Short Fiction and Poetry Inspired by David Bowie's music, movie roles, and life! 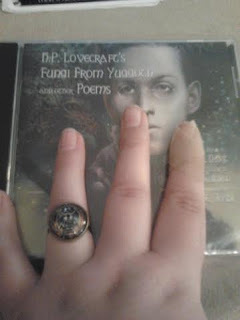 A collection of brand new material from some of the greatest and freshest voices in both the fiction and poetry worlds! All proceeds from the sale of this book, in print or digital, will be donated to Cancer Research and Cancer Care!" Read that?? All proceeds go to cancer research so we don't have to see our heroes get taken away like this. 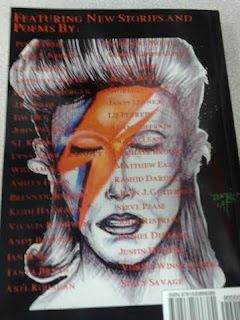 Also, my poem, Venus, has been accepted for the winter issue of Eternal Haunted Summer! If you haven't checked them out yet, they are a Pagan publication with a focus on deities from all different pantheons. 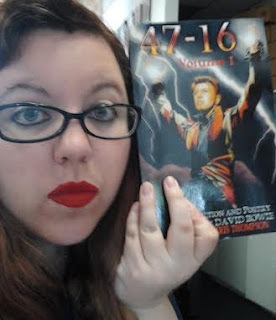 You can read every issue for free on their site. 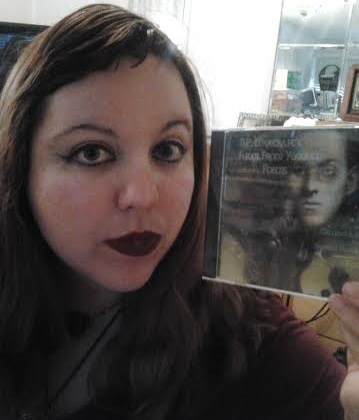 Kyle and I were ecstatic to be trial listeners of this material in its earlier form and received an advance copy of this epic CD. 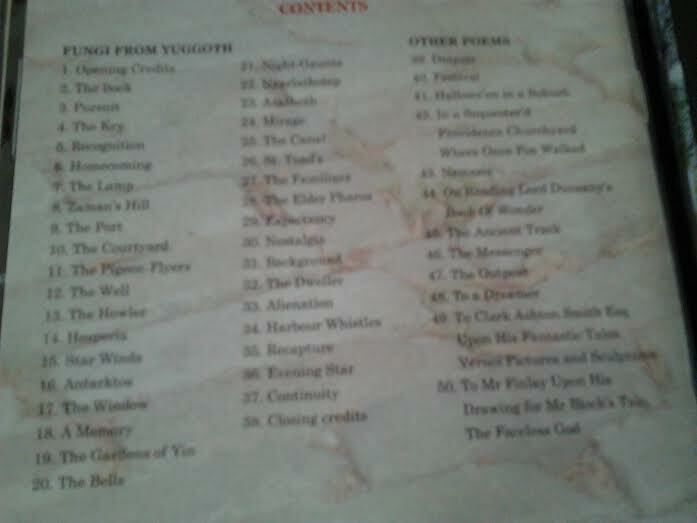 There are 50 pieces read on here with the first 37 being the Fungi from Yuggoth. 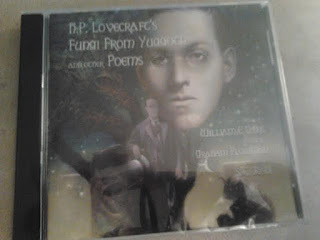 Will's reading voice is the most amazing reading voice ever and he blows these poems out of the park! 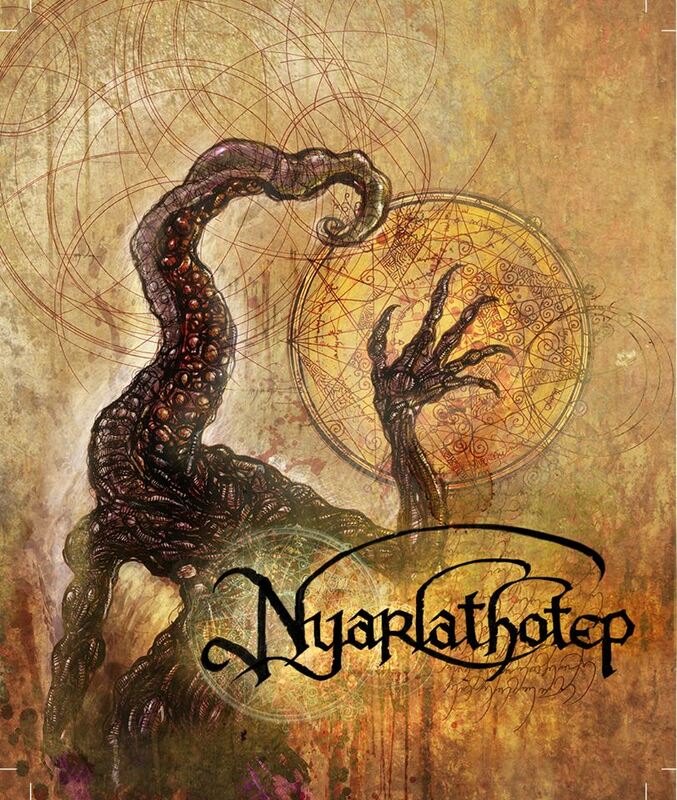 I would highly recommend getting this CD and succumb to its eldritch enchantment. 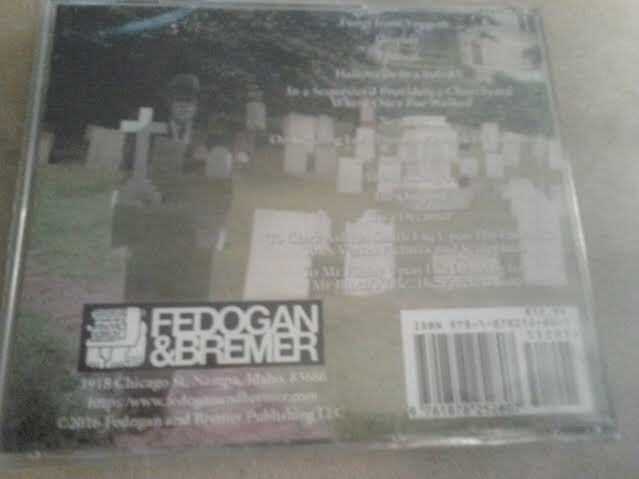 The score on this CD is absolutely amazing. Each poem is brought to life with the perfect atmosphere each score brings. 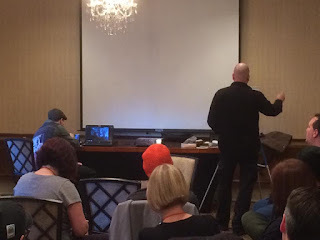 It is unfortunate that KrallCon is on the opposite coast of where we live, so Kyle and I made a video poetry reading that was played at the con. It sounds like everyone enjoyed it which is great. We only did one take so it's kind of humorous. You can barely see our faces on the laptop. Dave Felton is drawing illustrations inspired by our poems! I am beyond flattered. Here is an unfinished piece based on my poem Winter Witch! 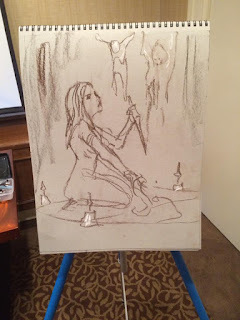 Poems I read were Carathis, Winter Witch, Medusa's Mirror, and Painted in Blood.